With the miracle of pregnancy and childbirth comes the not-so miraculous side effect of weight gain, stretch marks, and new-found curves that may not be all that welcome. In my case, that included a whopping 60 (yes, six-zero) pounds. Wanting to be the very best mother to my son that I possibly could, losing the weight and reclaiming my energy and confidence were a crucial part of this journey called parenthood. With a nutrition and workout plan in-hand, I remained focused on the task before me and within two months had lost 35 pounds. Over the next six months another 15, and finally an additional 20. While I felt great about all that I had accomplished on my own, there were still areas that I just couldn’t tackle no matter how much I hit the gym or how clean I ate. The volume in my breasts had all but vanished and the excess skin that hung from my abdomen proved to be far more stubborn than I had anticipated. While looking online for other women who had experienced the dramatic weight gain and loss and the resulting “issues”, I came across the Mommy Makeover. Knowing that I had put in an extreme amount of effort and accomplished so much on my own, this seemed like the best option for me. Realself.com users gave the combination of procedures a 99% rating, confirming my thoughts that it would all be worth whatever might lay ahead in terms of cost or discomfort. I had two consultations with local surgeons and determined that Dr. Franklin Rose would be the most qualified and highly skilled. We decided to do the traditional combo of liposuction, abdominoplasty, and breast augmentation with the new “gummy bear” implants, which look and feel natural and have virtually no chance of rupture or leakage. He asked if I would mind documenting the experience for ABC to show others what to expect and being the social media butterfly that I am, I readily agreed. Within one week of our initial visit, I walked in to First Street Surgical and the amazing staff made me feel completely at ease as we went through all of the pre-op procedures. Dr. Rose and his nurse, Pam came in a few minutes before I went under to make sure that I was comfortable and ready to go. The camera crew stood by and before I knew it, I was being whisked off to the operating room. In what seemed like no more than a minute, my eyes were fluttering open and I realized that I was in recovery. Something in me expected an extreme amount of pain, but there was nothing. I chalk it up to a wonderful anesthesiologist and the very talented hands of Dr. Rose. I had some chills as a side effect of the general anesthesia, but no actual pain. They kept me overnight and while the soreness and discomfort did set in the following day, it was very easily managed and while walking, felt like I had simply done an incredibly intense leg workout. There was the quintessential “hunch” that comes with having the abdominoplasty, but I was able to stand up straight within a few days. Believe it or not, I went for sushi with some friends the very next evening! 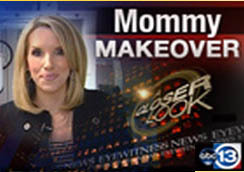 Review the video from ABC 13 featuring Dr. Franklin Rose’s Mommy Makeover on Shellie! If you’re interested in reading more or would like for me to answer any of your questions directly, I’ve posted a few things on my blog HERE, HERE, and HERE, and my story was even featured in Lucky Magazine! You can see the ABC story here. It sounds so cliché, but the only regret that I have in this whole experience is not doing it sooner. The staff at Utopia MedSpa were so welcoming and supportive throughout the entire process, and I could not be more happy with the incredible job of Dr. Rose. This is the second summer that I’ll be able to confidently spend in a bikini. I have finally regained self-assurance in my body and continue to set a good example for my son by eating properly and living and active lifestyle. I’m very proud to be able to say that I made an honest effort to get my body back in shape prior to the procedure, but wouldn’t think twice about encouraging other women to go through with the Mommy Makeover if they’re looking for a wonderful way to get back their pre-baby body.